An unaltered photocopy of your DD-214 displaying your Assault Vehicle Crewmember Professional primary or secondary MOS, or completion of Assault Vehicle Crewmember training. 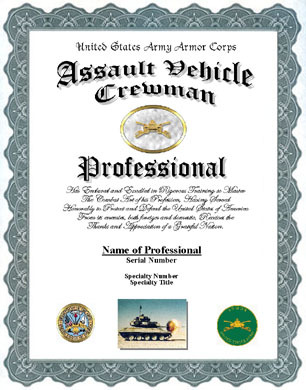 If your DD-214 does not display Assault Vehicle Crewmember status you must provide a copy of your DD-214 and a copy of military-issued orders or other documentation authorizing your Assault Vehicle Crewmember status. 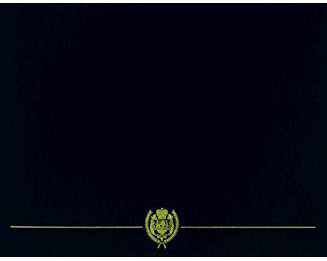 This Display Recognition is available ONLY to authorized recipients who possess orders, or authorization form, or release documentation that confirms award eligibility. (See "Issue Requirements"). To obtain either a Display Medal or a Display Recognition for your authorized award you will be required to provide military-issued documentation authorizing your award. There are no exceptions. Be advised that on request any knowingly fraudulent document sent by you will be released to the Federal Bureau of Investigation (FBI) that may result in prosecution and/or fine/imprisonment. Please complete and MAIL this APPLICATION FORM. Don't forget to include an unaltered COPY of your DD-214, WD AGO 53-55 or other pre-arranged document(s). You have endured and excelled in rigorous training to master the combat art of your Profession, having served Honorably to protect and defend the United States of America from its enemies, both foreign and domestic, receive the thanks and appreciation of a grateful Nation.